We offer high quality FRP Chemical Storage Tanks. 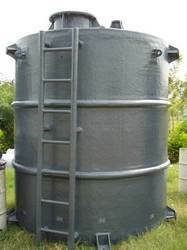 The use of high quality raw material makes our FRP tanks durable, reliable and safe. The FRP Chemical Storage Tanks we offer are manufactured as per client’s specification. We address the individual requirement of clients from different industries and assure high quality and trouble free FRP Chemical Storage Tanks at competent prices. We manufacture and export Industrial FRP Chemical Storage Tanks for the storage / accumulation of chemicals, water, waste, slurry etc. We are also manufacturing FRP and dual laminated reaction vessels, pressure vessels and vacuum receivers that are required for mixing, washing and filtration processes. Our range of FRP reaction vessels is offered with suitable lined agitator, gear box and electric motor. Whereas, the pressure vessels and vacuum receivers can be designed to suit the operating pressure up to 10 kg/cm2 and for full vacuum services.